and to train the N.C.O. or Officer in fire direction. Below: a 1916 advertisement for the Hill-Siffken Company's products. 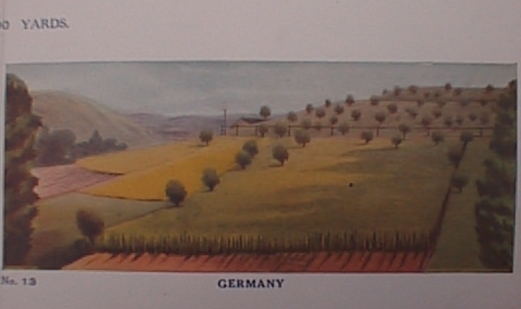 Below is a First world War representative Landscape target by the Hill-Siffken Company dating from between the Wars. between the wars, from 25 inches ( WWI) to 30 and 40 inches post (WWII). The system then operated is, in modified form, still in cadet and service use today. recognizing TARGETS and shooting at them. 3. Set the sights for harmonized firing (1,400 for No. 2 Rifles, "H"
allow any further adjustment of the sights. and get each man to show you where he aimed. mark; shots in the small rectangle count two, in the large rectangle one." 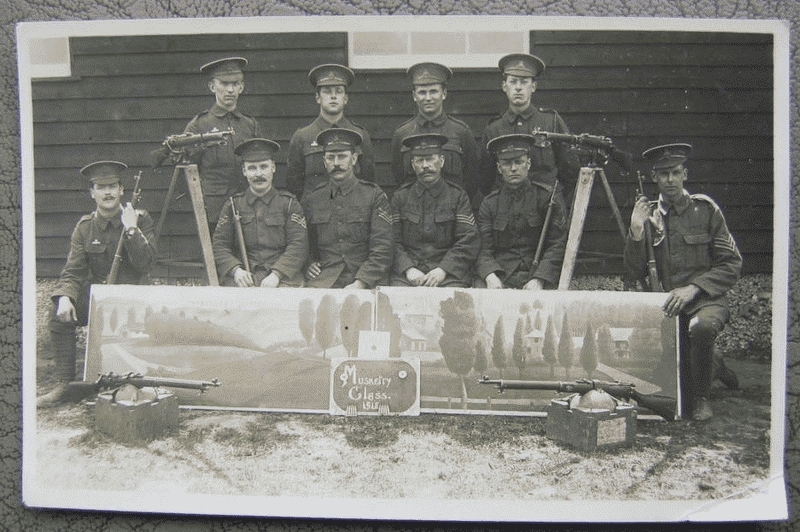 Below is a photograph of a Musketry Class of 1915 taken with a Landscape target utilising the "Continental" Series sections nos. 9 & 10, probably at the completion of a course. 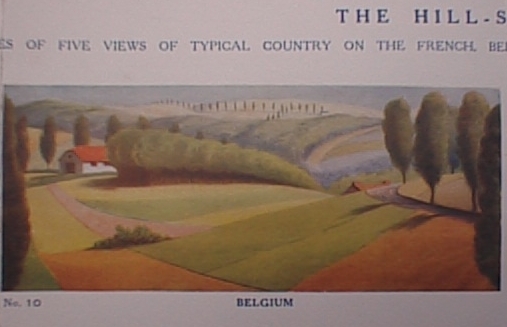 No.9 was representative of a 'actual country in France' and no.10 of the same in Belgium. The sections were designed to be approximately linked side by side in any order, by virtue of the half pine-tree printed at each side of each target, as shown in use in the photograph below. view the quality of aim of the student. Corrective instruction could then be given as necessary. 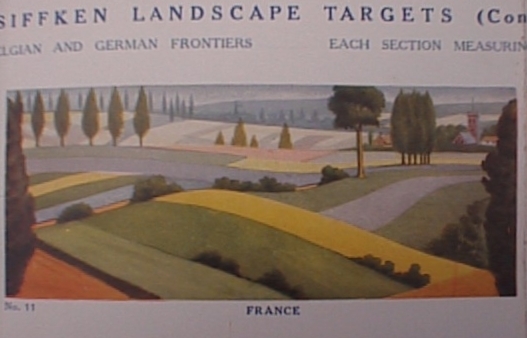 used Landscape targetry between the two World Wars and during the latter 1939-45 War. 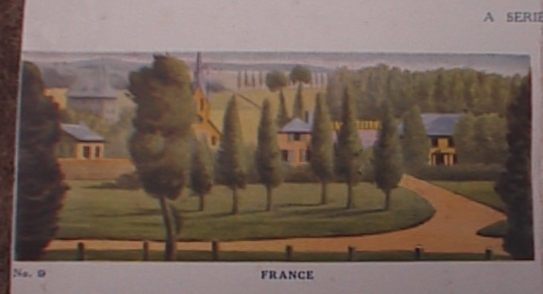 and the printed landscape backing; a very elaborate setup altogether. 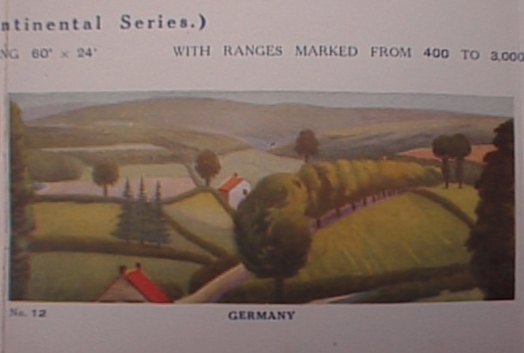 Below: in 1939, this was a miniature landscape range at the Handel Street Drill Hall, the London Headquarters. .. and the same arrangement was used, as well as for rifle training, for machine-gun instruction, although the setup appears rather 'posed'. The team are 'shooting' on the "English Series" of Hill Siffken targets (sections 1,2 & 3) dating from as early as 1913 - see details lower in page. 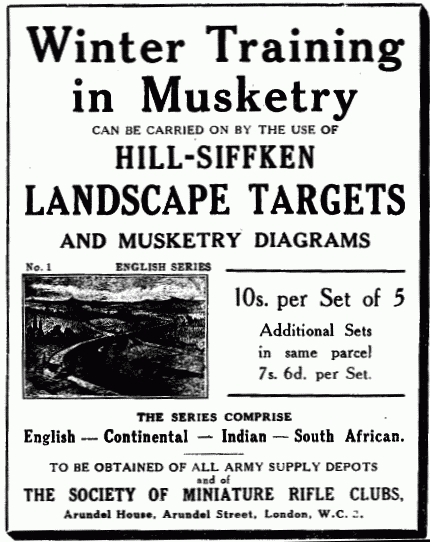 A.G. Parker & Co. Ltd, and latterly Parker-Hale, advertised the Hill-Siffken targetry from the early 1920s through until the Second World War (1939-45). Even the advertisement remained the same, the only difference being an increase in the price of the targets of 2/6d ( half-a-crown) for a set of 5. In 1925, these had been 12/6d (twelve shillings and sixpence - or 62½p in current parlance). It is interesting to note the form of the measuring rule, with an integral plumb-line, used to assess scores by relating the hits on the "sky screen" to the aiming points on the target upon which fire had been directed. authored by Quartermaster Sergeant D. James of the School of Musketry, then at Hythe in Kent. 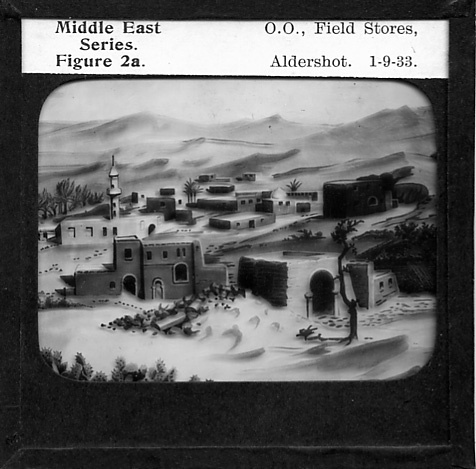 By 1937, many of such slide images used original photographic transparencies rather than artist drawn representations. Equivalent Landscape Targetry systems to those shown on this page are still in use today by the Regular, Territorial and Cadet Forces for training. 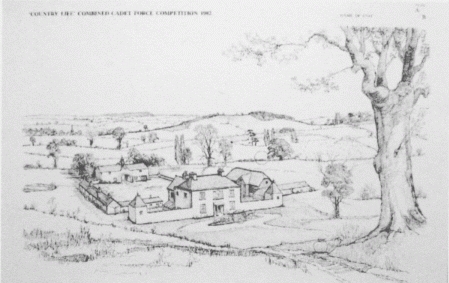 The associated annual Cadet "Country Life" Competition, which has been run for many years, is also of particular note. Since the mid 1990's these targets have been printed in colour. 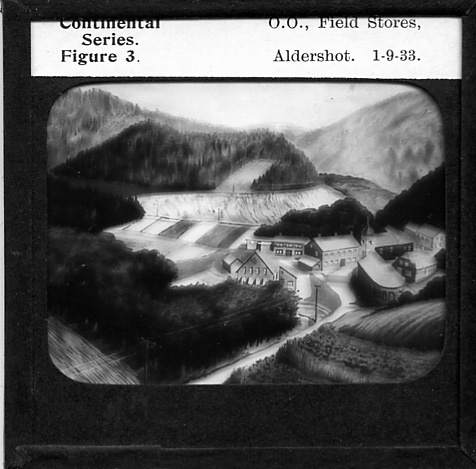 More sophisticated systems have also been developed, using film projection onto screens and, of course, the inevitable computer generated scenery and scenarios. A replica 1918 period landscape target setup has been produced for use on outdoor small-bore ranges. and subsequently at Bisley historic rifle meetings and in conjunctiion with classic miniature calibre rifle exhibitions. The arrangement is shown above in Summer 1999, with two Lee-Enfield No.7 and two No.8 rifles being made available for those who entered into the main competition to try their hand on an informal basis. It is an unusual and popular event because teams of three or five can enter the competiton (with two/four shooters and a spotter/observer). Of the pair of competitors above, the gentleman on the left is using his own S.M.L.E. No.2 Mk.IV* and on the right one of the No.8 Lee-Enfields . The spotter holds the Fire Control instruction sheets giving the team their four targets for the detail. Only he has access to the Signalling telescope. He is required to pass fire instructions to his team of firers using typical methods involving reporting representative ranges (dependent upon the height of the aiming point on the landscape target), and 'Clock', 'Finger' or other directional instructions from pre-advised notable landmarks on the target. There is obviously a tight time limit for the specified number of shots to be fired on each of the four targets dictated; thus only a combination of accurate, succinct and clear instructions, combined with accurate shooting , will win the day. Left is shown the method of using a plumb wire topped by a grouping guage to score the hits. The pointer at the base of the plumb is placed over the specified aiming point on the landscape target, whilst the grouping guage falls over the bullet strikes on the "sky screen" approximately 27 inches above. The latter day sky screen is hessian with brown paper pasted to the face side. Patching is then simply achieved with brown paper tape. To the right of the picture can be seen the sighting target for zeroing the 'harmonised' sights. The lower black rectangles being the aiming marks, with the hits being adjusted to the twin rectangles above - representing the dimensions of the group scoring guage. See "BRITISH TARGETS from the mid 19th. Century"